In the cool, pale-grey surroundings of his quietly rock ’n’ roll London office, Mick Jagger is doing something he usually avoids at all costs. The Rolling Stone, whose motto is ‘Don’t look back’, is sifting through the decades, dredging through memories of the world’s most infamous band. And that means talking about curry – and more specifically, how he’s going to recreate the unique aroma of his favourite takeaway dish for a ground-breaking new interactive Rolling Stones exhibition. A brief pause, followed by another pungent blast of odour d’Stones. ‘Keith’s old socks and alcohol,’ he yelps, recalling the bedsit he shared with the guitar player in Edith Grove, Chelsea, in the early Sixties. The reason for the Stones’ singer rolling back the years is Exhibitionism, a £4 million mega-show that will be held at London’s Saatchi Gallery next year (Apr-Sept). It is the first retrospective of the band once so terrifyingly drenched in drugs, danger and debauchery that parents were warned to ‘lock up your daughters’ when they rolled into town. Talking for the first time about Exhibitionism, Jagger reveals that it will feature a series of interlinked ‘immersive’ rooms in the life of the Stones, from that grotty flat to the sights, sounds and smells of the recording studio in Barnes where the band recorded six albums, including Let It Bleed, Sticky Fingers and Beggars Banquet. There will be a guitar room and a spine-tingling recreation of an ‘about to go on stage’ experience. Books, photos, records, instruments, clothes, guitars, artefacts, stage props, artwork, film and a cornucopia of exotically random band ‘stuff’ have been gleaned from collections around the world. All of it, for now, is currently tucked away – for security purposes – in a vast hangar somewhere way off the grid. Right now, his Satanic Majesty and I are sitting side by side, flicking through just a few images of 50 years’ worth of stage clothes and watched from the walls by mounted bronze silhouettes of Charlie Watts, Ronnie Wood, Keith Richards and previous member Bill Wyman, along with an Andy Warhol lithograph of Elvis Presley. It’s not often you get to sit so close to someone so famous, whose music is part of our collective sonic consciousness, whose sexual prowess is the stuff of tabloid legend and whose stadium-sized presence can take your breath away. His face, close up, is more Lucian Freud than rock Lucifer and even at 72, his skinny frame permanently seems to crackle with energy. Initially, Jagger is in edgy headmaster mode, borrowing my pen to make notes as we study the flamboyant fruits of his closets, furrowing his brow to give time, place and dates he wore a checked suit, and an Allsopp Brindle & Boyle purple velvet number with fancy gold brocade. And then we alight on photos of three Ossie Clark jumpsuits, a peculiar rock fetish first started – so he says – by Jagger himself and later worn by everyone from Michael Jackson to Lady Gaga. Back then it was Jagger, Elvis, Bowie and Freddie Mercury. So, who wore them best? Jagger laughs. ‘Obviously me! Elvis was too big, David was too thin and Freddie was too late on the bandwagon. 'Some of them are beautiful and some are more hilarious than beautiful, but I loved them all. He leans back in his chair. He can still, he says, get into every item of clothing he has ever worn. The snake hips remain permanently honed at 28 inches. ‘Not that I go home and put everything on again, like something out of Sunset Boulevard,’ he says with that louche London drawl. ‘In fact a lot of my clothes got taken by my kids. Lizzie was the worst, the most blatant; she’d go out wearing a pair of velvet trousers I’d worn at the Roundhouse in 1969. 'Then she gave me a pair back for my birthday. I love getting my own things back for my birthday. At 72, is he still vain? He laughs and pulls a face. Jagger is amused by his own controversies. The iconic Michael Fish white dress he wore at the 1969 Hyde Park free concert has floated off into the ether like all those butterflies he let loose from the stage, but ‘there is another one. I bought the same one in orange. Innocent is not a word often associated with Jagger. The same could be said about the word emotion. Jagger is a genius at talking about himself without revealing his feelings. I ask him if this trawl through the band’s past has made him feel an emotional pull to any part of his past. ‘No,’ he says. ‘I’m not like that and this for me hasn’t been a personal indulgence, it’s about trying to work out something that would be an incredible experience. Jagger pulls out pictures of two jackets worn during the Stones’ 50th anniversary tour, a stunning butterfly print worn at Hyde Park and an oakleaf design worn at Glastonbury. Both were designed by his ex-lover of 13 years, L’Wren Scott, whose suicide in March 2014 was a devastating blow to Jagger. It is something he has never spoken about. It is all he will say. Jagger does not do – has never done – emotional outpourings. We return to the subject at hand – his clothes. Who is the most stylish member of the band? As a band, the Stones have few contemporary rivals. As an iconic pop star, who does Jagger believe matches up to his swagger? It’s obvious Styles has modelled himself on a young Jagger with his long hair, velvet jackets and Jagger-esque flamboyant twists. He is now, of course, Sir Mick, a multi-millionaire performer worth more than £300 million, film producer, father of seven, grandfather, great-grandfather and friend of artists, intellectuals and aristocrats. In his private life and other work, he is less of a showman, and after starring in the cult movies Performance in 1968 and Ned Kelly in 1970, he has not appeared in an acting role since Freejack in 1992. Currently co-producing the HBO series Vinyl with his old mate Martin Scorsese (starring his 30-year-old son, James, as a punk singer), Jagger turned down the chance to appear. ‘I said no,’ says Jagger with finality. You wouldn’t want to argue with him. The combative edge of the teenage rock rebel remains in place. Jagger is not happy with the word ‘retrospective’ when talking about Exhibitionism. ‘It’s not going to be like walking into a museum,’ he says. ‘It’s going to be an event, an experience... immersive. Yes, it’s about the past but it’s about the present and it’s about what we’re going to be doing next – we’re not stopping, we’re booking studio time for new recording this month, we’re still on the road. Jagger has spent a lifetime being talked about. He’s been jailed, honoured, pilloried as a long-haired, drug-crazed demon, deified by fans, lauded by critics, lusted over by women and analysed by university students of both music and literature. ‘What I like about Mick’, his friend and musical collaborator Joss Stone told me, ‘is that he’s never let anything get to him. If you think about everything he’s been through in his life, he could be very, very weird and remote. 'You can’t exactly call him normal because he’s Mick Jagger, but he’s a lot more normal than most people in this industry. Stone’s observation turns out to be accurate. Remarkably he tells me that he still occasionally uses ‘normal’ public transport (of sorts). He is forensic in his vision of Exhibitionism, and gets animated when describing a room of ‘curiosities’: priceless trinkets picked up along 50-odd years travelling the rock highway. ‘In the 18th century men would collect things, from shrunken heads to axes, like a precursor of a personal museum. It’s that sort of idea,’ he says. He and Watts have spent several weekends visiting the Saatchi Gallery ‘just, you know, to have a sense of how it will be’. 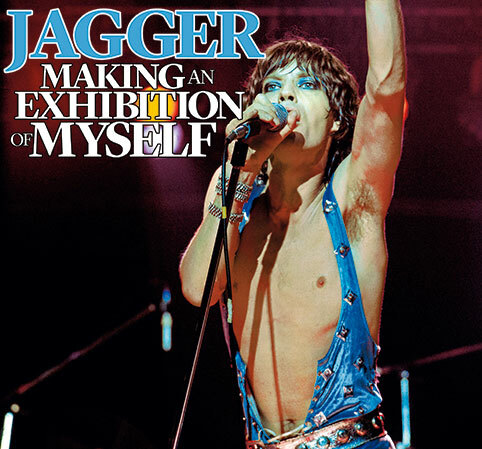 The point of Exhibitionism, Jagger says, is for the viewers to feel ‘as if every room they walk into, it’s one we’ve just that second left or maybe that we’re still there’. He is, of course, joking. 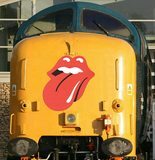 While Exhibitionism will attract many of those fans who venerate the Stones, Jagger refuses to partake in any form of po-faced homage. ‘It’s the right time,’ says Jagger. ‘People are doing these things, great events whether it’s Björk or that incredible Human Body exhibition. Jagger has no problem admitting he often has to ask which songs were on which Stones albums. And as for the guitars that have plucked and strummed their way through the anthems of generations, Jagger drops a bombshell. ‘I didn’t keep any myself. I mean, other people kept ’em but I didn’t. ‘I don’t care about guitars at all, there’s no sentiment for me in guitars. I mean it’s all b******* – each one is the same as the next one. 'All that “you have to have this one” – it’s all c**p. I’m not an audiophile – it doesn’t make any difference what guitar you play. It’s what you play that counts. ‘I mean, we have them there and a lot of people love them. Keith loves them. But if anyone is asking, I’m being honest, guitars were never my thing. He shakes his head. ‘We’ve had to spend a lot of time getting everything together from all sorts of places, all sorts of people. Now all these things have a value, but when you’re in a band, when it’s happening, it’s all ephemeral stuff, so much disappears. A lot of our old stuff we’ve actually had to buy back over the years. ‘Like notepads. All my notepads. I wish I’d kept them all but they just go – bits of paper with lyrics on, you just leave ’em lying around. 'It’s all very dodgy. I always tell them they wouldn’t be able to do this with a Monet, they’d end up in jail, but you can just rock up with a gold disc you’ve nicked from a studio and, bang, it’s in an auction. Sometimes they get withdrawn, sometimes we buy them back. Oh, the irony. Jagger raises an eyebrow. On his walls there are two Andy Warhol lithographs. Warhol designed two album covers for the Stones, Sticky Fingers and Love You Live. The Warhol estate has lent the band the original artwork. ‘We didn’t get that. It’s Andy’s work, you don’t get to keep it. It’s his creation. That’s fair enough,’ he says. He finishes by steering things back to Exhibitionism. He gets up to go, we shake hands and he leaves the room, taking all that crackling energy with him. His notepad remains open on the table complete with pages of hastily scribbled notes. I have to confess I am – for a couple of moments – almost tempted. Edited 1 time(s). Last edit at 2015-12-06 15:23 by bye bye johnny. Thanks Bye Bye Johnny... Great Read, very nice. Thanks. "...we’re not stopping, we’re booking studio time for new recording this month, we’re still on the road"
EDIT: Sorry, guess they mean Exibition Tour. Right? Right. Edited 1 time(s). Last edit at 2015-12-06 18:18 by 35love. "It is planned that following the London exhibition EXHIBITIONISM will visit eleven other global Cities around the world over a four year period." Nice article! Thanks for posting. Keith saved the guitars and Mick just saved the clothes, pretty telling that. Confirmation of Stones studio time booked! Gotta love that. Good piece, thank you, bbj. I guess they are recording soon, huh. Funny, I never considered Mick a fashion icon. I can just picture Bowie rolling around the floor in hysterics as he reads the article. So, Harry Styles and One Direction are the new Rolling Stones then. Maybe time to book some 1D tickets to watch the heirs then? So nice to read, thanks bbj. Blimey, Jagger has a 28 inch waist......yet Bowie was even thinner. Nice read, thanx! Studio booked, yeah! It's so strange that there has been no European-tour '73-book, those photos witj MJ in the Ossie Clark jumpsuit are so iconic. I almost spilt my beer on the carpet! 28" hips, hips - astonishing!! Can't wait to see Keith's black Les Paul Custom! Mick, Mick, Mick..."Each one is the same as the next one?" You just broke all your guitars' hearts. Seriously? No wonder you and Keith don't do joint interviews! I'd be happy to take any guitar you'd care to discard!